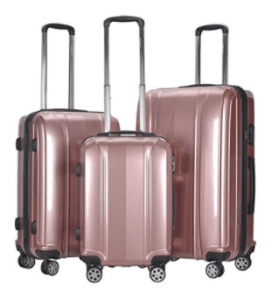 Rose Goplus SU-50222PI-GB is a modern, hot new release hardshell suitcase set that includes three pieces of small carry-on, medium and large suitcases for your formal business and informal leisure trips. This modern luggage set is made of ABS + PC material that is lightweight, flexible and robust. It is conveniently rain-proof, can withstand a bit of abuse by the airline staff (absorbs impact well if put through stress), and should prove to be durable over your frequent travels over the years. The zippers on the three suitcases seem to be solid and good quality. And the main zippers are connected to the three-digit combination code lock to help keep your belongings safe on your travels. 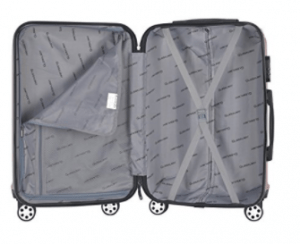 The wear-resistant aluminum telescoping trolley handles on these suitcases have an ergonomic design and are 21 (cabin), 17 (medium) and 13 (large) inches. And with the help of these comfy and durable telescoping handles you will be able to roll your luggage easily and on its four smoothly rolling wheels. These are mute- roll quietly and multi-directional so you can rotate the luggage in pretty much all directions easily and smoothly. You can also hold the luggage either vertically or horizontally by the fixed handles on the side or the top- whichever feels more comfortable for you. You can take the smallest suitcase on the plane and fit in the overhead locker easily as it weighs just 5.6 pounds (33-pound weight capacity and 32-liter capacity) and measures 13.4 x 7.9 x 18.5 inches. You need to check in the 24-inch and the 28-inch suitcases as they’re a little too big for being taken to the plane. The 24-inch medium size bag weighs 6.8 pounds (40 lb weight capacity and 55-liter storage capacity) with the measurements of 15.7 x 9.4 x 22.4 inches. The largest 28-inch suitcase weighs 8.5 pounds with 49 lb. weight capacity and an impressive 86 liter storage capacity and it measures 18.1 x 11 x 26.4 inches. There is an internal zipped divider and elastic straps on the other side to help keep your clothes and other belongings in place. The main compartments in all three bags are pretty good in terms of storage capacity. And with the pockets in the fully lined interior (210D polyester lining) will help you organize your stuff better and keep them tidy. These bags look stylish and elegant, with a premium appearance and look probably more expensive than they actually are. You will get these bags fitted into each other- small into medium and medium into the large suitcase. And you can feel free to store them this way.